A distinguished chef, Heat Laliberte has worked in Vancouver’s top restaurants and hotels. His resume includes positions at Blue Water Café and the Fairmont and Westin Hotel brands, since his cheffing career started in 2005. He’s even cooked for world-class athletes at the 2016 Summer Olympic Games in Rio de Janiero, and for the 2018 Winter Olympic games in Pyeongchang, South Korea. But Laliberte (Cree-Métis) was hungry for more. During the time he was refining the charcuterie and butchery program at the Fairmont Pacific Rim in Vancouver, he came across an ad for the Aboriginal Business & Entrepreneurship Skills Training program at the Vancouver Aboriginal Friendship Centre. That altered the trajectory of his career. Laliberte applied, got accepted, and learned how to develop a business plan and start a business. “Because I’m a chef, I knew that I wanted to do something around food. I’m very passionate about making charcuterie—especially sausages and bacon. It’s something that I’m really good at,” Laliberte told Native Business Magazine. 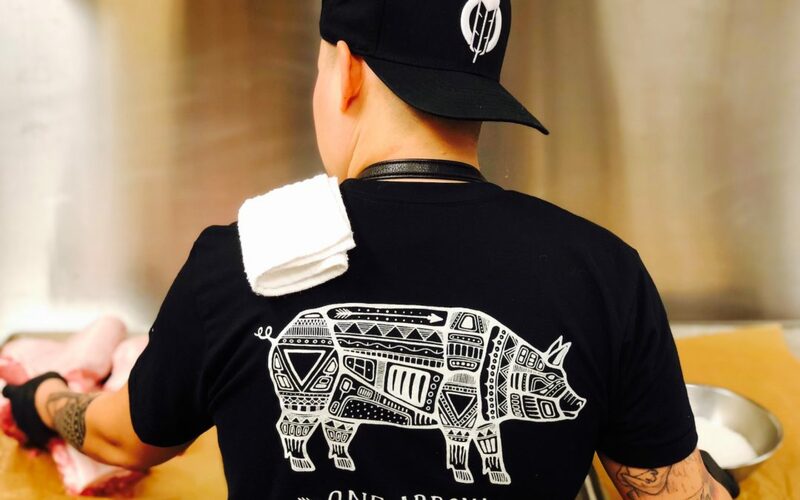 After Laliberte graduated from the Aboriginal Business & Entrepreneurship program in November 2016, he put his salary toward self-funding One Arrow Meats, his artisanal, naturally-smoked bacon business. “It’s always been a dream of mine to be a vendor at the farmer’s market, so my idea was to open a stall at the farmer’s market selling my artisan bacon. We had a couple months to prepare for the final presentation [through the Aboriginal Business & Entrepreneurship program], so I was working on different recipes, glazes and different kinds of pork belly,” he said. In January 2017, Laliberte won the best business idea and presentation for the course. “That gave me the confidence to apply to the Vancouver Farmer’s Market as a vendor,” he said. Today, Laliberte is all about making customers smile. His client-base is growing at the farmer’s market. “People want to hear about your product and how you make it and where you source everything from,” he said. So, what’s his spiel? Laliberte tells potential customers that he’s a First Nations entrepreneur who started One Arrow Meats to make small-batch, hand-cured, naturally smoked, hormone-free bacon. “I use natural ingredients to support the local B.C. [British Columbia] economy. I have different flavors. I have a hickory-smoked maple bacon; the maple syrup is from Squamish. I have a black pepper and honey; and I use honey from White Rock, which is a suburb of Vancouver—so it’s local, wild flower honey. I have a Chinese Five Spice; and I have a bacon that I call Salt and Smoke that has no sugar added—which is great for people with health issues like diabetes. That is actually selling quite well, because a lot of people are trying to stay away from sugar these days. I take a lot of pride in my product, and I just want to share it with the people of Vancouver,” he told Native Business. In addition to the farmer’s market, One Arrow Meats supplies small butcher shops in the greater Vancouver area, and residences and small businesses in Vancouver can order the bacon through a delivery service called SPUD.ca. Laliberte is also talking with a grocery store chain right about supplying four of their stores. “We’re just working out the UPC code. We’re doing an inspection, and it’s picking up steam,” he said. When it came to developing his brand, Laliberte turned to his friends skilled at website or logo design. “My new logo with the pig is done by an Ojibwe artist-in-residence at our Aboriginal Hotel downtown,” Laliberte shared. For photography? He paid his friends in bacon. Literally. While Laliberte is a one-man show, he contracts outside help, such as hiring an accountant for his taxes. He handles the bookkeeping internally by logging each sale through an app on his phone. “I try to keep as organized as I can with all my invoicing,” he told Native Business Magazine. Laliberte currently works full-time as the butcher at the highly regarded Culinary Capers Catering & Special Events in Vancouver, where he additionally rents 6,000 square feet of space for One Arrow Meats—“ideal for product storage,” he said. Still, Laliberte’s considering when he can make the leap to full-time entrepreneurship. “It’s also about that fear of the unknown. If you quit your full-time job, you’re going to have to make your business succeed. All that pressure is on you now,” he said. “Once you start your own business, you pretty much have your hands in everything—from logistics to your deliveries to ordering all of your packaging and doing all the pricing for your products and getting all your ingredients. It can be very overwhelming, so it’s not a bad thing to ask for help or advice from people. Just shoot an email off to someone who has a business and is a lot older than you and ask them how to deal with this,” he advised. Laliberte also emphasized the importance of learning one’s trade. “It’s something that can’t be rushed, especially when it comes to food. You need time to perfect your product and work out the kinks. It has to be a labor of love, and cannot be rushed. This is not an easy buck. You need to take the time and put love into it,” he said. A few months ago, Laliberte spoke to youth through Good Food For All about his experiences in the food industry. “I’ve also donated money, and I’ve done food drives for them to stock up their pantry. It’s such a great organization,” he said. Beyond his commitment to Good Food For All, Laliberte enjoys talking to First Nations youth about staying out of trouble and finding a goal and a passion.